Gain inside access to one of the world's best martial arts masters, Zak Lee. Zak will teach you how to lead a safe and effective kickboxing class. Zak is a 2-time European Champion and world champion. 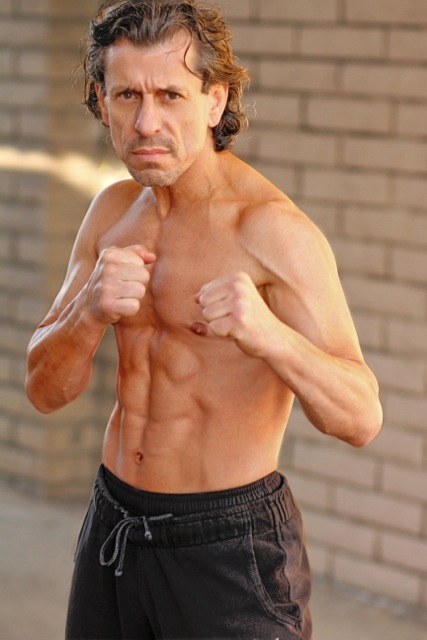 He is recognized in the U.S. and Europe as a dynamo kickboxer and martial artist. Zak continues to train clients, teach classes and perform on the big screen as a Hollywood Stunt Man. This kickboxing certificate program is an intense calorie crushing course that serves as a great way to expand your clientele and earn additional income. If you would like to take the exam and do not need any study materials, choose KI Exam Only. For optional study materials, choose the Online Study Package below. How to design a class or session with both equipment-based and non-equipment-based kickboxing formats. How to build basic drills, body conditioning exercises and choreography tips based on different martial arts styles. How to execute a variety of punches and kicking techniques properly. How to create combinations with punches, kicks or a variety of both. How to create conditioning drills for your clients. This exam is given via a live proctor through www.passmyexam.net. Proctor fee paid at time of scheduling. Students must take the online exam through Pass My Exam. Please click here for specific exam information..
You will be given 60 minutes to take the 42 question exam. Need to study on the go? We offer a print version of the manual for this course, allowing you to study wherever, whenever! Our Kickboxing Instructor Manual contains full descriptions and demonstrations of the techniques discussed in this course. Zak Lee has been in training nearly all his life, owned and worked as group fitness manager in two sports clubs in Italy and developed and taught his fitness programs at Equinox, Spectrum Clubs, Bodies in Motion, 24 hour Fitness, David Barton Gym and many more. Zak has studied with such renowned masters and champions as: Hirokazu Kanazawa, Toshio Yamada, world kick boxer champion Dev Barrett, the legendary kick boxing champion, Benny "the Jet" Urquidez and world kick boxer champion Peter "Sugarfoot" Cunningham. Zak also spent time in China perfecting his moves and forms through rigorous training at the Shaolin temple with the Monk Liang Yiquan and trained in Wing Tsun under the W.T.O. organization founded by Master Leung Ting and continues to train in Filipino martial arts under Guru Daniel Inosanto. Zak has been recognized for his creative form (kata), a specialty that has earned him countless trophies. It combines Shotokan, Kung Fu Shaolin Quan and Viet Vo Dao. Zak became the first most famous competitor in Italy and Europe in Music/Creative form. Start your dream career helping people get moving and get healthy! The NCCPT has been certifying health and fitness professionals for 20 years and counting. Nationally recognized, we provide students the best value for the best price.